Based in Arlington, VA with close family in both Columbia, SC and Jupiter, Florida. I love the fast-moving pace and challenge of working in technology. Growing up with a dad that was always tinkering and building computers from scratch encouraged me to focus my ambition in technology. I enjoy being outdoors in the summer with my pup (Lab mix) and will never turn down the chance to listen to live music. My favorite concerts so far this year have been Cher and Darius Rucker. I also enjoy traveling and I am currently planning two trips, one to Iceland and one to Cuba! As a technology sales professional specializing in IT management services and solutions, I help organizations find the most effective approach to handle their IT challenges including round-the-clock end user support, network monitoring and management, as well as their IT project support needs. I am passionate about building long-term relationships and delivering results that better my clients, my company, and myself. After gaining a full understanding of my clients' needs, I most enjoy that aha! moment when I uncover the right solution for them. One of my favorite testimonials to what Dataprise has done for a client comes from our partners at Breaking Ground. They say, "I know that they are Dataprise, but to me they are Breaking Grounders. They are in there with us solving problems, if need be, 7 days a week at any time of the day. They define the word partner in partnership." 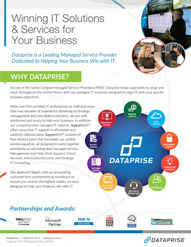 At Dataprise, we realize that IT is not a one size fits all business so we tailor our solutions to complement your existing team and/or address your specific IT challenges. What can we do to help you? 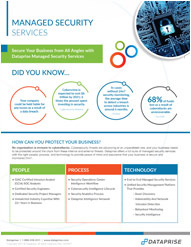 Are You Getting The Most Out Of Your IT? We'll provide you with a free IT Environment Assessment to gain valued insight into your network and the overall condition of your environment. Dataprise has been providing Managed IT Services for more than two decades, and we have extensive knowledge and IT expertise in almost every industry. For a limited time, I'm offering you a free IT Environment Assessment to gain a deeper understanding of your environment. So, what are you waiting for? Fill out the contact form before your competitor does. No strings attached!